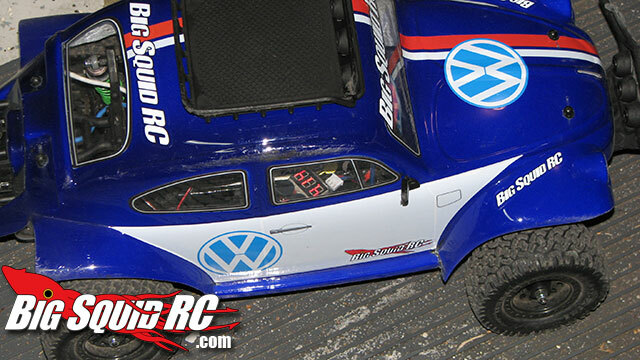 MaxAmps Low Voltage Alarm Review « Big Squid RC – RC Car and Truck News, Reviews, Videos, and More! 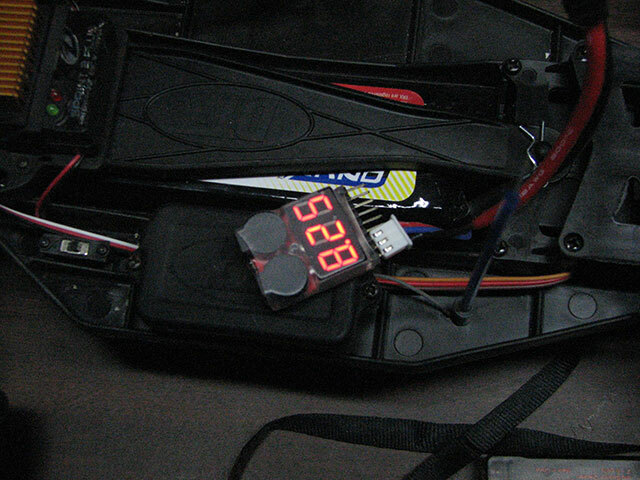 Primary Competition– There are a few other battery testers and low voltage alarms out there. Some come on a key chain, others you can install like the MaxAmps one. What’s In The Box– What you see is what you get. a Circuit board with some TINY instructions on the back, and a big red segmented display on the front. Build Quality– The LVA showed up just fine. No issues, nothing needed to be fixed. Test Venues– Pit Tables, Bash Spots, street. Set-up Notes– You are going to need a JST-XH style balancing tap on your battery pack to use it with. Also, we used double sided (servo) tape to attach it to our vehicles. Usually stuck it on the receiver box, then plugged the battery in. 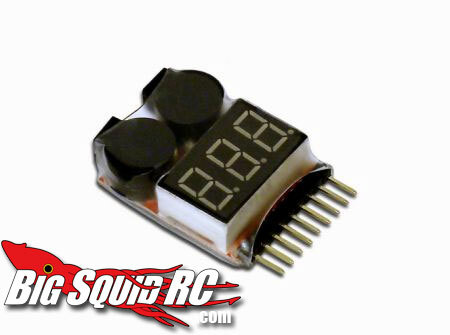 The LVA can handle a 3.7v(1-cell pack) up to a 29.6v(8-cell pack). Usage– While testing, there were a few surprises. Sometimes the alarm would sound, and I would be thinking to myself, wow.. if it wasn’t for the alarm, I for sure would of kept running a bit longer. And then the complete opposite would happen later. I would bring the vehicle in thinking.. well, I must be close to done, only to see there was still a decent amount of juice left, and I can get in some more bash time! being able to just pull the vehicle up close, and look through a window (if you didn’t paint them) and see the actual voltage you have left is REALLY a nice feature. I have owned several voltage checkers that were basically on a key chain, and you would lean down and plug it in.. it’s great being able to leave it plugged in when you are running. Note, you should NOT leave it plugged in if you are not running the vehicle. It’s only going to run down your battery, and that could cause some serious issues if you leave it and forget about it. 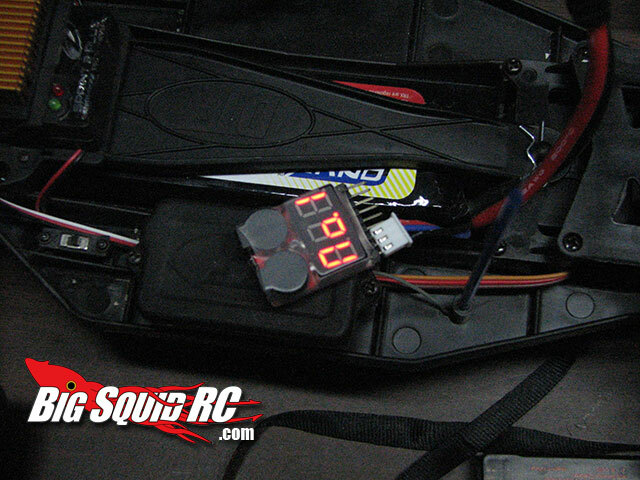 So always unplug, just like you normally would the lipo from the ESC. The display cycles through the ALL cell voltage, then the individual cells. It’s also a great way to keep a eye on the cells if you have not been putting them on a balancer and they get off by a bit. Or maybe you have a cell that isn’t doing so well. The Alarm is nice and loud. It’s easy to hear under most circumstances. It’s light enough, and small enough to not be an issue fitting it wherever, you just have the short wire from the battery to deal with, so it can’t go too far. There is the ability to adjust the voltage cut off, but we would recommend just leaving it at the factory default of 3.3v. In the end, it’s a good product. I like having it on my vehicles, and miss it when it’s not there. Time To Bash – 10.0/10 -Plug it in, tape it down, and go! Workability – 9.0/10 -Easy to adjust the cut off, but wouldn’t recommend it. Car Show Rating – 8.0/10 -Looks good, and it’s easy to see and read. Bash-A-Bility – 8/10 – We have had it in several vehicles while beating on them, and it’s survived every time. A waterproof version would be nice. Value- 7.0/10 – It’s not the cheapest on the market, but it works well. Big Squid Rating – 8.4/10 – Tentacles.. A handy item to have with you, and use while running. If you have been having issues with battery packs, this may help you out a lot in figuring out your issue.